The new Naked Glow Lip Lift Glosses combine state-of-the-art skin care technology with ultra glossy, delectable and irresistible colour cocktail concoctions. 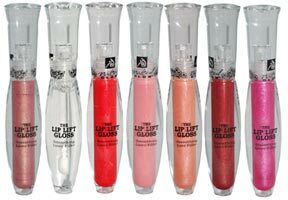 The result - high gloss lip glosses that fill in lines, smooth lips and provide intensive treatment. Lip Lift Gloss features marine filling spheres that work to fill fine lines and smooth lips for instant visible results - lips look smoother, fine lines less noticeable. Natural Organic Oils heal and soothe, whilst a mega dose of vitamin E helps to rejuvenate. No petroleum and no parabens. Your lips have never felt or looked so pout-worthy and kissable! Angel Martine, Mai Tai, Peach Daiquiri, Pink Lady, Sangria, Berry Martini, andKir Royale.